in case You are hosting a .pgn file on the net. 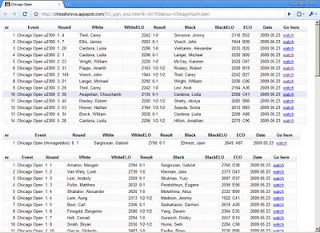 chess games for chess tournaments from PGN sources. Place a short link on your site in result. 1. Internet Explorer is slow for this tool. 2. The result will be hosted on Google App Engine. 3. Max 2000 games on one link. many times each day- do it. Google hosts everything and there are no limits. 6. The process does sorting by events, then by rounds. 7. You can take data directly from a web link. There is 1Mb limit for such feature. The whole listing of all tournaments in this database is here. I like "Chessforeva for chess tournaments"
very much. I want to install it on my chess web site. Can you send me the source code? My idea was to get "tournament by link" that allow people to post just by email, tweets or simply put it in blog. In fact this is a bit "crap" if compared, for example, to Chesstempo's. I mean, takes lots of space on screen, lags on tablets and mobiles, and sometimes even can't parse some pgn-s. If You like, use it, but it is not worth spend time trying avoid old code bugs. I hope, next my try will be better.